Southwest Rapid Rewards is offering double points for flights booked and travel from October 14 to November 21! To earn the double points, you need to register your Rapid Rewards account number to take advantage of the promotion and if you don’t already have a Rapid Rewards account, then create one before you begin booking your reservation and then register your account. Double points can be earned for all levels of Southwest tickets purchased: Wanna Get Away?, Business Select and Anytime Fares, but if you are working to earn the Companion Pass note that the extra points will not qualify towards the pass. 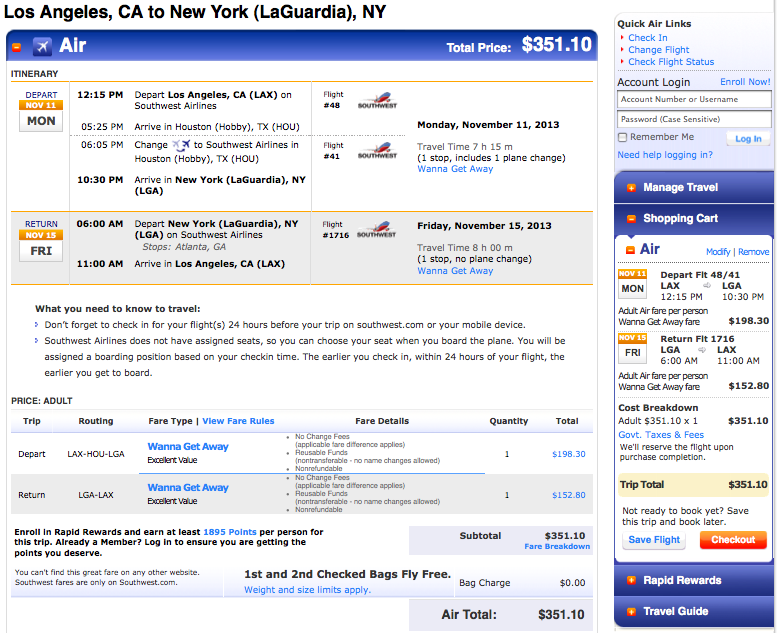 Flights must be booked and traveled by November 21 in order to take advantage of the promo. You must have a Rapid Rewards account and be registered for the promo at the time of booking. You cannot request the double points after booking! If you fly with a Wanna Get Away purchased ticket to New York from Los Angeles in November a sample fare is $351 which results in 4,212 Rapid Rewards points. That is doubled of what you would normally earn. You can redeem flights with Southwest as low as 5,000 point so this is a pretty promotion. If you’re interested in more Rapid Rewards points and earning the Companion Pass, you can consider applying for the Southwest Airlines Rapid Rewards Premier Visa which has a 50,000 point sign up bonus after a $2,000 spend. This offer comes up every few months so if you are not ready for it now, you can hold off because it is likely to come back.